The logo is one of the most important factors of branding, it is a visual identity of your business which should be clean and simple to remember. To come up with your own logo you should have some basic knowledge of image editing software such as Adobe Illustrator or Photoshop, or else you need to hire a graphic designer. Well, not only these two options but there are some free online logo maker tools available on the web to create catchy logos for your company. In this article, we have listed the best free online logo maker tools to create a stunning logo for your business. Canva has the best graphics resources for all your business needs, whether it might be an email header, Facebook cover, letterhead, brochure or logo, everything is available here. When it comes to logo, Canva has thousands of well-crafted logo templates and almost all the templates are free, you can choose any free logo template and customize it according to your needs, you can download your logo in PNG, JPG or PDF format once you are done with your customization. Designevo has more than 5000 professionally crafted logo templates which are fully customizable. Just click on “Make a Free” logo button and select your business category, then select any logo design that matches your business and enter your business name. That’s it now you are ready to customize your logo, you can add the slogan, choose a different font and add the shapes to your logo. Once done with customization, click on the “Download” button. You can download your logo for free by giving credit to designevo or opt for the paid plans. WIX is a well-known website builder which also offers a free online logo maker tool to create an ideal logo for your business. To create the logo in WIX, enter your company name and tagline then choose your industry after that choose the logo style such as modern, creative or funny etc., WIX shows you some sample logos to either like or dislike. Next you will be asked for what purpose you need a logo – like for website or social media etc. select the appropriate option and you will get a list of well-designed logos, choose any logo that fits your business and download it for free. Logojoy let you create high-resolution logos with vivid styles and color options. Just like other online logo generators this tool also comes with a wizard interface to create the logo, but with more options to customize it. Logojoy provides you the SVG image of your logo once the design is complete. Graphic Springs has a wide range of logo templates and customization options to create the best suitable logo for your business. To create the logo just enter your business name and select the business category, then you will get a huge list of logo icons, select the logo icon that best matches your business and you are done with your logo. Further, you can decorate your logo with cliparts, shapes or decorative lines which are available in Graphic Springs library. Logogenie has more than thousand professionally designed logo templates to choose for your business. All you need is to enter your company name, company tagline and select the industry type, and Logogenie generates the best suitable logos for your business. Logogenie let you select the logo type such as icon based, shape based or font based logo. You can add clipart or shapes to make your logo look even better. Designimo let you create a professional logo for your business, it has the good collection of logos for most of the industries such as technology, finance, Food & Restaurant, medical, real estate and fashion etc. 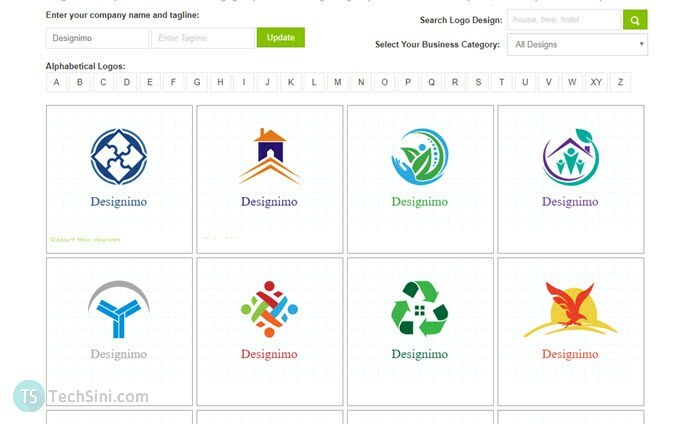 Just type your business name and Designmo will provide a list of logo templates, pick a logo and customize it the way you want. Designmo has the handy customization toolbar that let you tweak your logo the way you want. Free logo services is a most popular online logo creator tool, with the collection of more than thousands of logo templates to choose from. Creating a logo in Free logo services is quite easy, just select the logo category that suits your business and enter your company name and click on “Choose a design button”, further select the logo style and font to generate the logos. Finally, pick a logo that best matches your business and save it. 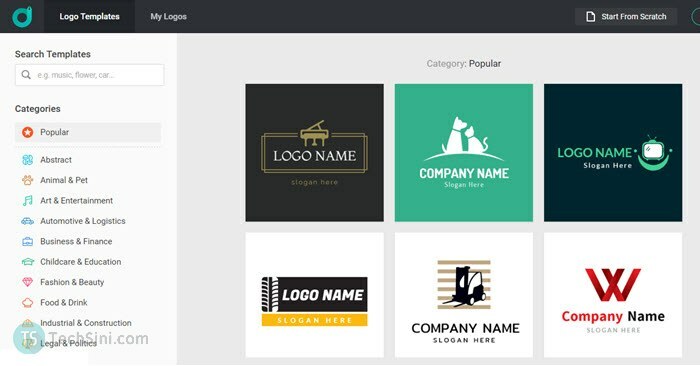 Logaster let you create professional logos in no time, it has the logo templates for all kind of business needs including agriculture, art & design, finance, marketing, education, science, entertainment, fashion, food, banking and medical etc. All you need is to enter your company name and hit “Create a Logo” button, In the logo preview screen you can add the business tagline and select your business category, you can also set the logo color here. Logaster previews your logo on the notepad, visiting card and paperweight. You can download the small size logo for free in Logaster. Tailor Brands is unique in their approach to logo design in that they harness the power of AI to create logos instead of using templates. In addition to their logo maker tool, Tailor Brands also offer a suite of automated branding tools such as business cards, watermark tools, brand books, and social media creatives. We have added both the paid and free logo makers in this article so be sure to check the pricing page before continuing with any online logo maker tools. We would like to add a note that Canva, Designevo, Logaster and WIX Logo Maker tools let you download your logos for free in JPG and PNG format.